EIGHTY m.p.h. on 600 c.c. 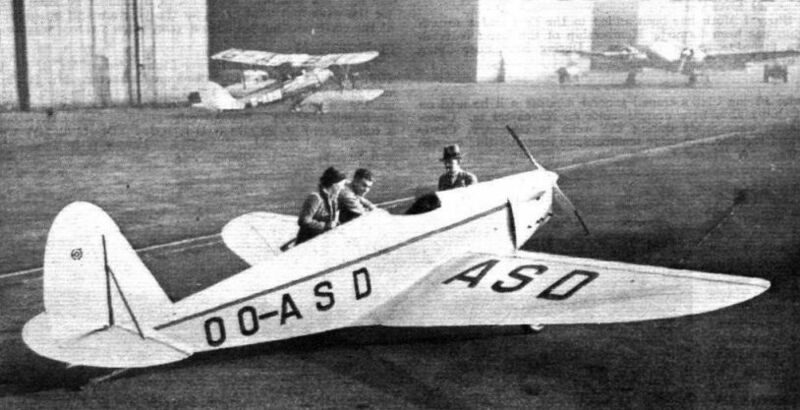 AN intriguing little single-seater monoplane, the Tipsy "S," with a 600 ex. Douglas engine, has been ДальшеMore>>> built by Mr. E. O. Tips, who represents the Fairey Company in Belgium. According to Mr Tips the machine flew for about an hour and a half on the first day it was launched and made several landings; no modification or adjustment was needed. 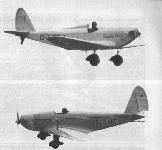 A low-wing cantilever monoplane was decided upon after several other layouts, such as biplane and braced monoplane had been investigated. The wing is entirely of wood. There is a main spar of “I” section, located at the deepest point of the wing section about the first quarter of the chord, and an auxiliary box spar. Between the spars is a rigid diagonal pyramid bracing which maintains the torsional rigidity of the wing. This is further guaranteed by stressed plywood skin over the leading edge. The wing section tapers from R.A.F. 48 near the root to R.A.F. 38 and 28 and becomes thinner at the tips. Ailerons are large and differentially operated. Fabric covering is employed aft of the main spar. The fuselage, which is entirely of wood, embodies four spruce longerons with spruce frames assembled by birch plywood "biscuits," and is covered with a birch plywood stressed skin. 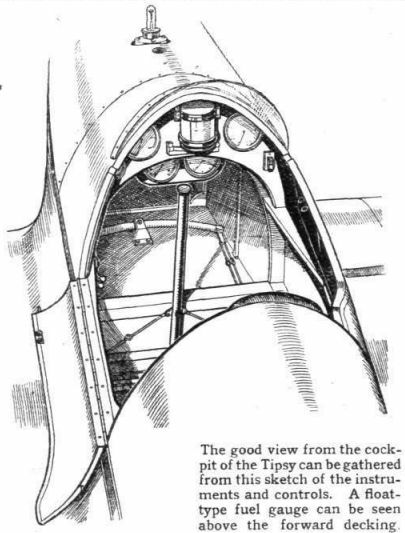 The pilot's cockpit is located at the centre of gravity. It contains all the usual equipment of touring machines and a light metal seat shaped to take a parachute. There is ample space for light luggage. The forward part of the fuselage is built integral with the wing. Flush with the trailing edge the rear part is assembled to this forward portion by four easily detachable nickel-steel fittings. The fin is plywood covered and built in one unit with the rear portion of the fuselage. It carries a fabric covered rudder, and is braced to the tail plane by two streamlined tubes. This latter member is fabric covered, has a plywood leading edge, and is adjustable on the ground. The elevators, likewise, are fabric covered. Rudder and fin are located forward of the tail plane and elevators, so as not to be screened by these members at large angles, or during a recovery from a spin. Two low-pressure air wheels, held in forks attached to the main spar, are embodied in the landing gear, the attachment points of which have rubber bushes. The forks and wheels are covered by elektron fairings. A 600 c.c. 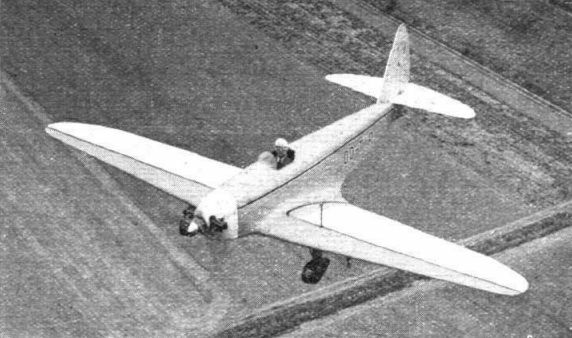 Douglas flat-twin engine is fitted and drives a two-bladed wooden airscrew. The engine mounting is of welded and riveted steel tubes, and the fireproof bulkhead, tanks and cowling are of aluminium. Span, 24ft. 6in. ; length. 18ft. 9in. ; wing area, 100 sq. ft.; tare weight, 267 lb. ; all up weight, 532 lb. ; maximum speed, 80 m.p.h. ; cruising speed, 70 m.p.h. ; stalling speed, 40 m.p.h. ; take-off run (without wind), 160 yd. ; landing run (without wind), 30 yds. Climb and ceiling figures have not yet been measured, but appear very good as compared with those attained by other aircraft of equivalent power. AS long ago as June 13, last year, the Tipsy S. low-wing monoplane was described in Flight, and at that time, before the ultra-light machine had made its complete re-appearance, the performance had seemed to be very remarkable in view of its extremely low power. In its latest form the Douglas engine is of 750 c.c., giving a consequently increased maximum speed. In the hands of Mr. Eyskens, the chief test pilot of Avions Fairey, the Tipsy, during its first demonstration in this country, showed that it did not suffer in comparison with the normal light aeroplane in the matter either of manoeuvrability or of take-off run. As might have been expected, the Tipsy S., which was designed by Mr. E. O. Tips of the Fairey Company, is now to be manufactured in this country - though, for the present, the maker's name cannot be divulged - and is to be sold for ^265, so that it will, in fact, be the least expensive aeroplane at present on the British market. At its cruising speed of 70 m.p.h. the range is a matter of 400 miles (an endurance of 5.7 hours) and there is a locker with volume enough for a reasonable supply of necessary luggage, so that this new single-seater can be treated as a serious means of singleton transport. Since the machine is an open single-seater it will probably appeal rather to the more sporting type of amateur, and for him the very effective controls will be a distinct joy. During the demonstration last Friday, the Tipsy was made to do all the more normal aerobatics and Mr. Eyskens did these at a low altitude with an ease and abandon which suggested that there was nothing tricky about its handling qualities. The view from the pilot's seat is remarkably good, and one can look almost vertically over the leading edge. Even in the tail-down position the view immediately ahead only is cut out. When in this attitude the pilot is, so to speak, almost sitting on the ground, so that the business of holding-off should present few difficulties. In construction the Tipsy is mainly of wood, with ply-covered fuselage, tail plane, fin and leading edge. The cantilever wing has main and auxiliary spars with cross-members arranged in pyramid formation. Steel tubing is used for the engine mounting and for the bracing of the tail plane. 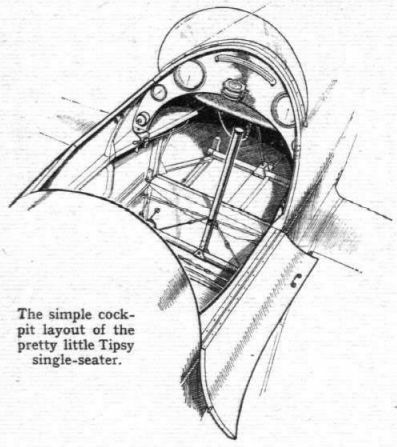 The undercarriage, which consists of two separate and fully faired legs, is notably wide, the track being nearly 7 feet. In its present form the engine is started by very effective "string and pull" methods, but the production Sprite engine will, of course, have an impulse-starter magneto so that the engine can be started by swinging the airscrew in the ordinary way. For the present, enquiries concerning the Tipsy S. should be made to Mr. M. C. Macpherson, Tipsy Aircraft, North Hyde Road, Hayes, Middlesex. Douglas Sprite Engine of 750 c.c. Length 18ft. 8 1/2 in. Climb to 1,200 ft. 2 min. 25 sec. MORE POWER FOR THE TIPSY: A single-seater Tipsy monoplane has now been fitted with a 40 h.p. four-in-line inverted Train engine, giving the machine a cruising speed of 110 m.p.h. This special Tipsy is sold over here by Brian Allen Aviation, of Croydon, at ?395. THE TIPSY "S" MONOPLANE, designed by Mr. E. O. 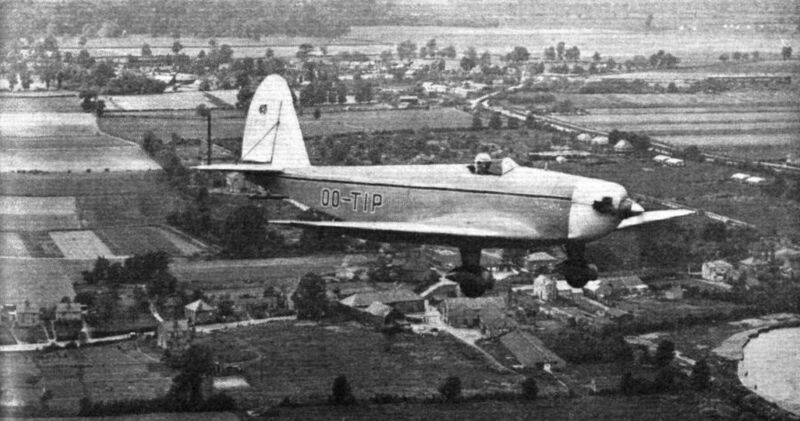 Tips of the Fairey Aviation company in Belgium, and now fitted with an Aubier et Dunne two-stroke engine, which has increased the speed to 94 m.p.h. Avions Fairey are laying down six of these machines, which will probably be fitted with the 750 c.c. Douglas engine, these, it is calculated, should give approximately the same performance. The Tipsy cantilever monoplane (25 h.p. Sprite). 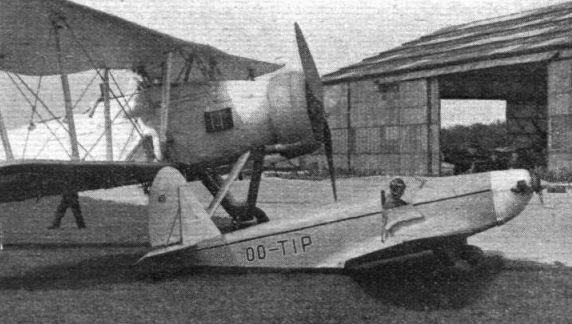 The Tipsy S.2 Single-seat Light Monoplane with enclosed cockpit (32 h.p. Sarolea "Albatross" engine). 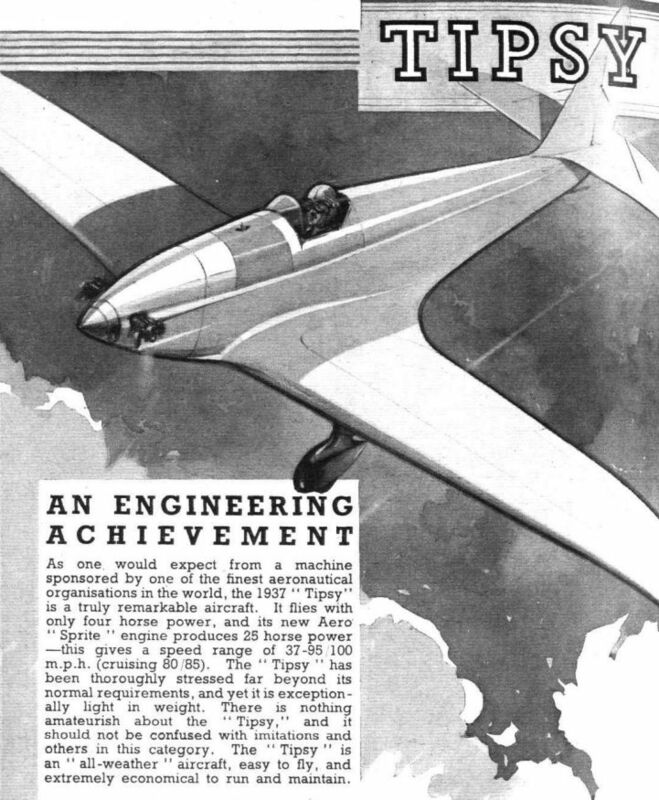 As one would expect from a machine sponsored by one of the finest aeronautical organisations in the world, the 1937 "Tipsy" is a truly remarkable aircraft. It flies with only four horse power, and its new Aero "Sprite" engine produces 25 horse power - this gives a speed range of 37-95/100 m.p.h. (cruising 80/85). The "Tipsy" has been thoroughly stressed far beyond its normal requirements, and yet it is exceptionally light in weight. There is nothing amateurish about the "Tipsy," and it should not be confused with imitations and others in this category. The "Tipsy" is an "all-weather" aircraft, easy to fly, and extremely economical to run and maintain.